Compare to Canada and Singapore, Uganda’s Internet is expensive. We don’t have unlimited data. In order to reduce our cost, I started to configue my computer to use as little bandwidth as possible. There are obvious things I can do such as not watch videos or download big files online. I also configured my Windows 7 laptop to not use more data than I need. Here’s what I have done for my laptop. Please note that what I done to my laptop might not consider as making my laptop secure. For example: I disable receiving updates for Windows and for the Anti-Virus program. I understand and comfortable with the risk I am taking. If you need Skype to communicate to friends and family and you find it useful to start Skype everytime you turn on your computer, please leave it as it is. The goal of this guide is for you to know what program is using data without realization and how to disable them. There are many programs, by default, send our personal data out for customer improvements. To be honest, these type of data usually don’t require too much bandwidth. On the other hand, some program uses up a lot of data without us realizing. 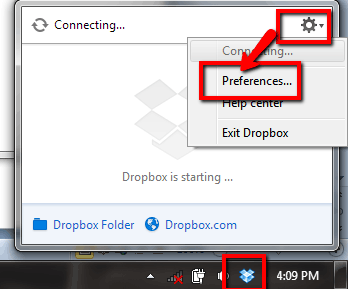 Dropbox, for example, if it is constantly sync-ing files, it can take up a lot of bandwidth. Warning: Disable Windows Update means you will not get critical update from Microsoft, especially if there Microsoft is patching a known bug a recent virus is exploiting. I read IT news frequently and so if I see anything fishy, I will run Windows update myself. 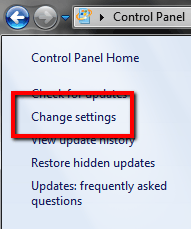 In Control Panel, click on Windows Update. Under Important Updates, change it to Never Check for updates. Under Settings, go to Update. 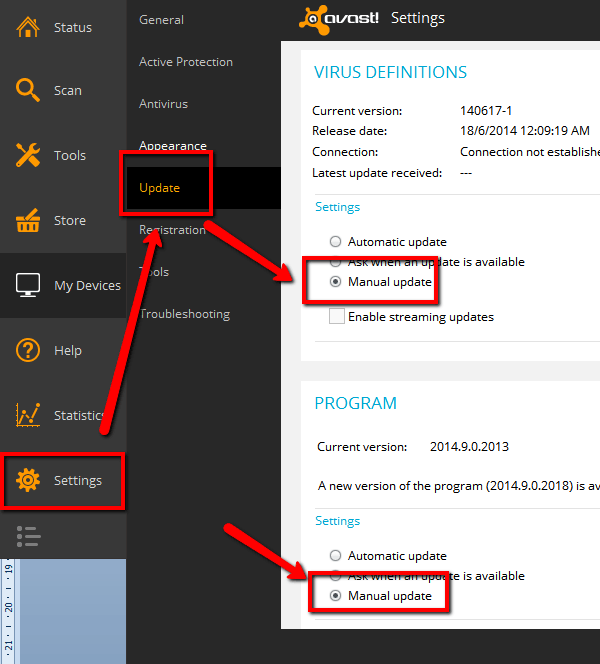 Under Settings for Virus Definitions and Program, set to Manual Update. 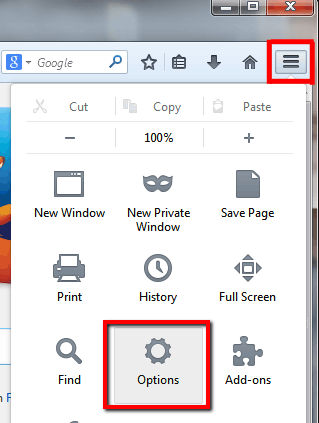 Look for the icon with three lines, click on it and select Options. In the Advanced tab, select Update tab. 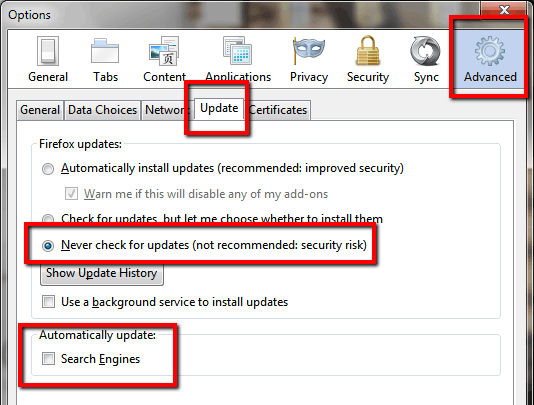 Under Firefox Updates, select Never check for updates. You can also disable Search Engines under Automatically update. 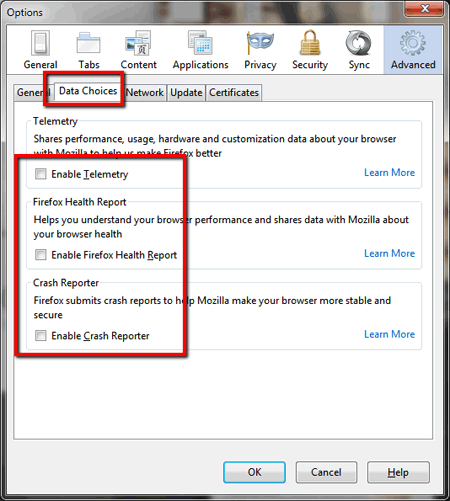 Under the Data Choices tab, disable Telemetry, Firefox Health Report and Crash Reporter. Unfortunately, to disable Chrome’s auto update you need to edit Windows Registry. This is not as simple and can cause problems with your computer. 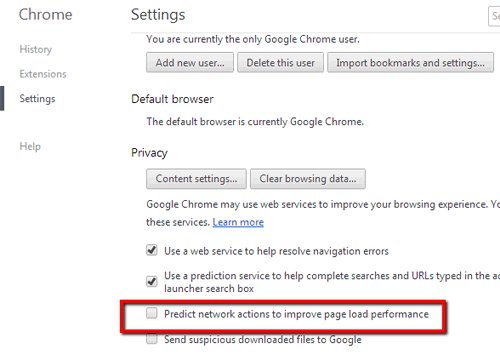 What we can do is disable Chrome’s network predictions and disable sync data to save bandwidth. Look for the icon with three lines and click on it. Then select Settings. 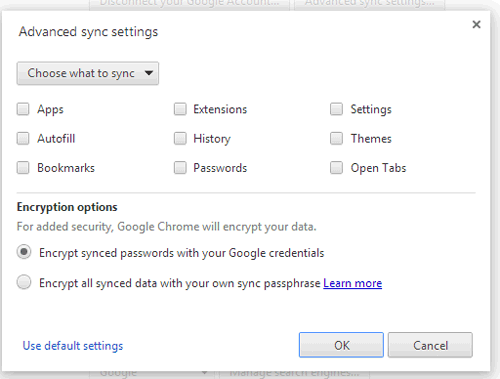 Chrome the option to sync your data (bookmarks, site history, passwords etc.) across these platforms. It is a great feature but it also uses up bandwidth. If you are comfortable without sync-ing your personal data, you can disable them all. Go back to Settings and click on Show Advanced Settings. The link is at the bottom. Under Privacy, uncheck Predict network actions to improve page load performance. 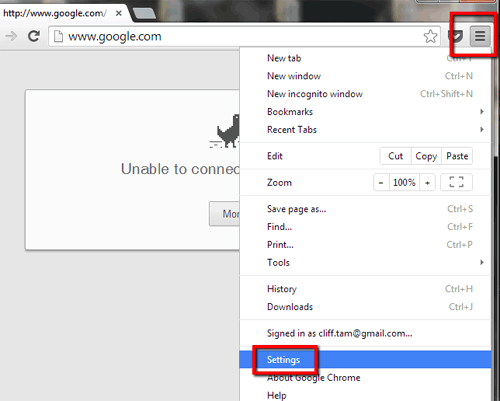 This options allow Google Chrome to predict the next link you will click in a webpage and pre-load the page. 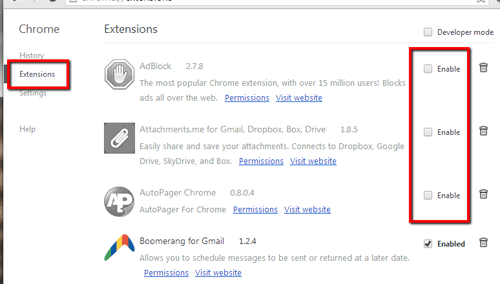 Lastly if there are Extensions you are not using, you can uncheck or remove them. 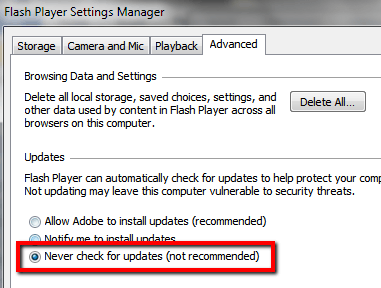 Flash Player requests the most amount of updates I’ve experienced from any programs! 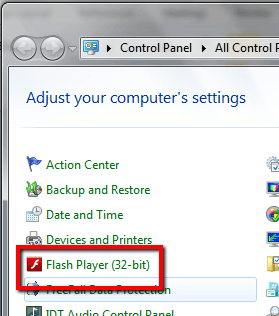 In Control Panel, select Flash Player. 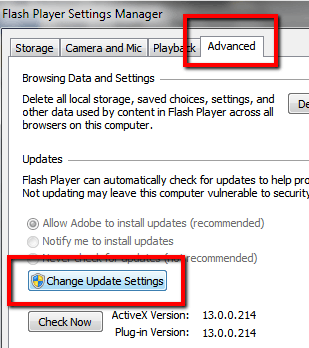 Select Advanced tab and click Change Update Settings. 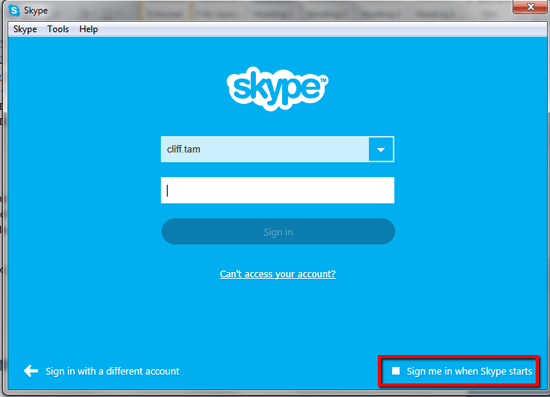 You can disable Skype from signing in automatically when it starts by unchecking Sign me in when Skype starts in the login screen. 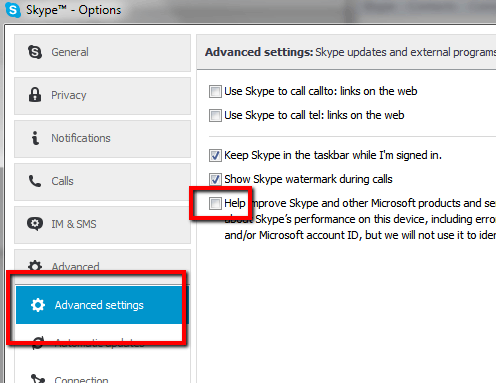 To disable Skype from starting when Windows starts, in Settings, go to General Settings and uncheck Start Skype when I start Windows. Under Advanced settings, you can uncheck ‘Help Improve Skype products…‘ so Skype will not send performance data to their servers. 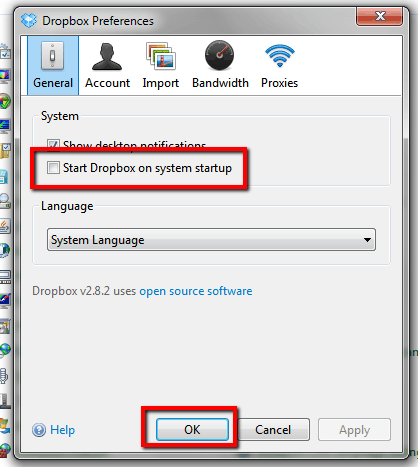 In General tab, uncheck Start Dropbox on system startup. Next to your icon, there should be another icon to indicate your chat status (Available, Busy etc.). Click on it and select Sign Out. 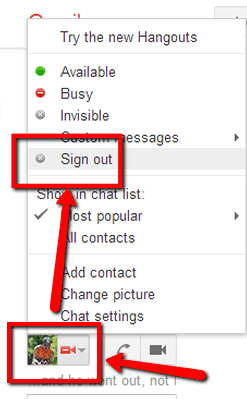 Facebook, like Gmail, also automatically sign you into Facebook chat when you logged in. You can turned it off to save bandwidth. 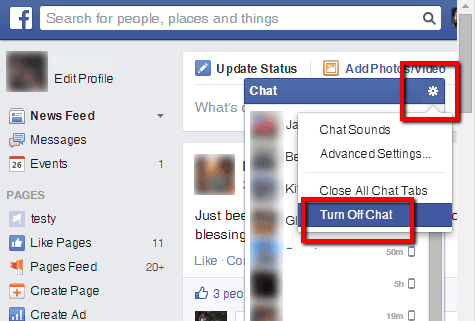 If you turn Facebook chat off, you will still receive and send messages via the Chat window. In the Chat window, click on the gear icon. By disabling Windows Update, you automatically disable Office updates. However, in Office, you can opt out of options that uses the Internet. I am using Microsoft Office 2010. In the menu, File, click on Options. 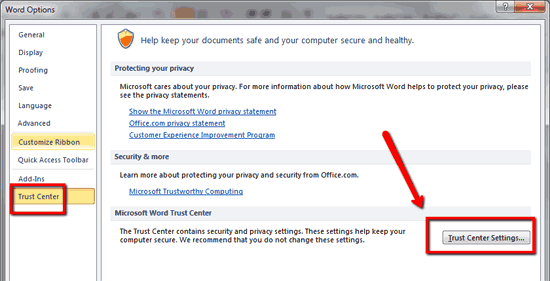 Under Trust Center, click on Trust Center Settings. Under Privacy Options, you can disable functionalities that connects to the Internet. Just wow n very very usefull. Thanks . Thank you. I may not live in Uganda, but, I live in the country and have very limited bandwidth. Very aggravating to have to keep monitoring your usage to not go over. I have already implemented alot of your suggestions that I did not know I could do. I’m glad you find it useful. Have a great day! Sorry for the late reply. When you start your laptop, press Alt, Ctrl and Delete and open Task Manager. From there you can see which program is using the Internet. That will be the best way to determine what is sucking up your data. Are there any advantages or disadvantages to running two blocking extensions @ the same time? Anyone?? Thanx! ; ) Grrrrr. As long as you have one extension that blocks all unnecessary traffic, then that’s all you need.